10K OHM POTENTIOMETER 4-20mA TRANSMITTER - Robert Owen Inc.
Use spare PLC 4-20mA inputs for position sensor measurement, with ROI-XMA potentiometer transmitters. 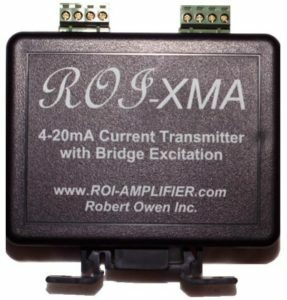 ROI-XMA potentiometer transmitters allow the simple measurement of industry standard potentiometers. Existing potentiometers can be connected to modern control systems. String pots, linear and rotary potentiometers, and other position sensors; the potentiometer is a simple way to add position sensor measurement to a PLC.